This map book shows all roads and trails in the state, along with many historical sites, points of interest and recreation areas. A mandatory book if you plan on venturing into the Nevada backcountry or off the paved roads. 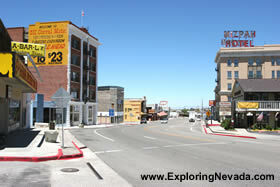 Tonopah is located on US 95 in west-central Nevada, about midway between Reno and Las Vegas. Although Tonopah is a small town, with a population of just 3700 people, the town has plenty of services due to its location on US 95. Tonopah also has a nice location for recreation. The beautiful Big Smoky Valley Scenic Drive begins just a few miles from town, and the Toiyabe Range Mountains are also nearby. Below are the varoius hotels in Tonopah that are available for online booking.